It looks like a Christmas Wonderland! Beautiful! LOVE all your Christmas!!! FAB time of the year! Everything looks so very wonderful!! The tree and garland look like something you'd see in a department store. Just stunning! Your home looks like Santa Land! It's so festive and colorful, there's no way to not get in the holiday mood sitting there with not one, but two trees. How do you have the time to do all that?!! It looks great, thanks for sharing your home with us. Wow! It all looks so festive and beautiful. All of these Santas are making me drool. They would fit right in over at my house. You have filled the house with Christmas. wow, love your Christmas decor, especially the nutcrackers! Susan, you're just got your own personal Christmas store going on. How nice is that? How beautiful! I love the way you set everything up. Especially the Nutcrackers! I bought my first one this year and plan to start collecting them. Thank you for hosting. Next week I'll post Christmas photos, this week for once I actually got OUTDOORS! Have a wonderful Christmas, Susan! Merry Christmas, you haven't missed a detail it looks like. . .Picturebook perfect, I love it! I adore your Santa ornaments that decorate your Christmas tree. You have such a lovely blog! Love your trees -- especially the Santa one -- was thinking about getting another tree and just putting the Santa ornaments on it-- they outnumber any other kind of ornament it seems! Christi already said what I was thinking "It looks like a Christmas Wonderland". I love the idea of a tree just for Santa's, everything looks magical. Thanks for hosting our gathering again today. Oh Susan, you have wonderful Christmas decor. I love all the Santas! [In fact, I have several of what you have...even the pillow with Santa's face]...I collect Santas. Such pretty decorations. It will be such fun to see how everyone has decorated for the season. I did not do a Christmas post this week. I will have to get photographing for a Christmas post next week. You are obviously ready to celebrate the most famous of all birthdays! Your decorations are so amazing! It must take an enormous amount of time and energy, not to mention the creativity that goes into arranging everything. Thanks so much for giving us a little tour! Wonderful collection of Santas and nutcrackers Susan; lovely decorations all! O my goodness, Susan...You REALLY go all out for Christmas decorating. It is all just like a Christmas wonderland. Very pretty. That was not one decoration, not two or three either...that was a lot. Very nice, merry christmas to you. Okay, just how many Santas do you have? I love Santas, but my collection pales in comparison. Have you thought about opening a Santa Museum and opening it to tourists? I've be first in line! I love your traditional Christmas decor. Nothing is better than red at Christmas! Everything is so festive and pretty! Susan I loved seeing your collections. Your home looks so festive and lovely. It's truly fun to see your home. 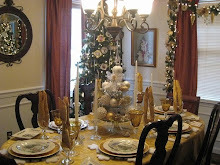 I love to visit homes and see other holiday decorating! How stunning your home is!! I am in awe. The decorations are SO pretty and I love all of your trees. What a festive winter wonderland!! I enjoyed seeing your inside decorations. I have a lot of Santas too but have never done a tree just for them. I have done one with angels. What gorgeous Christmas decor you have in your home. Thank you for sharing all that bright and cheery with us, and for hosting. Wow - you really go all out for Christmas! The room is gorgeous! Hi Susan, your post is perfectly lovely. The warmth of Christmas is in every photo of your beautiful home. Just gorgeous. Susan, your home looks so beautiful and festive. Your ornaments, the Santa tree is wonderful and I love the Nutcracker collection. Great photos. The Santa clause is just looking so cute and gorgeous adding more attraction and beauty to the shining of the lovely house. I haven't been participating in OW lately..not much to show..didn't know you were doing the Cmas decos! I really just wanted to come over and wish you a very Merry Christmas and a happy and healthy 2010 to you and your loved ones! Oh, I was hoping you would show your trees all decorated. Love the Santa tree. It's fun to dedicate a tree just to one theme. I have one of rooster ornaments. Such fun! This is much beautiful and santa is looking much gorgeous and beautiful.The house is much nicely arranged and decorated.